Screwdrivers are hand tools matching internal screw drives. Drivers for external drives (e.g. hexagonal bolt heads) are called wrenches. Please take the time to select the correct screwdriver for your needs as any mismatch might damage the tool or screws! We have a small but growing selection of "regular" screwdrivers. 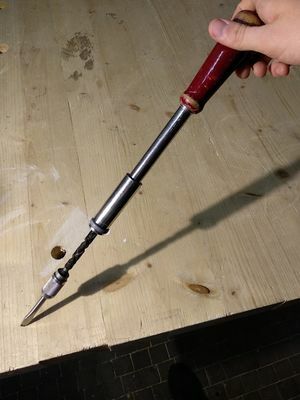 If you need a specific size for your project, you can check this page in advance and bring the appropriate screwdriver in case we do not have it yet. Some screwdrivers have interchangeable heads or blades which can be great if you want to save some space. Have a look at our list of screwdriver bits if you need something specific! 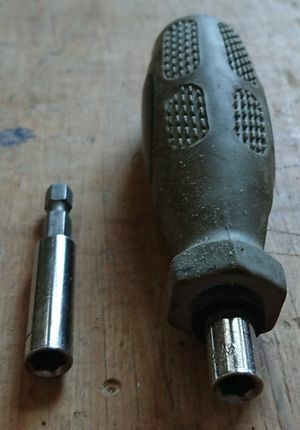 Common hex bit screwdrivers take in the same screwdriver bits as cordless drills (1/4"). Socket wrenches (1/4" square) can be fitted with adapters for 1/4" hex bits. Who knows what these are called? We came across two ratcheting handles where the entire screwdriver blade is exchangeable - an angled one with 6 mm blades and a straight one with 4.5 mm blades. It may be possible to adapt one to the size of the other, we'll have to see. All of the above are kept in a black leather pouch. Jeweler's screwdrivers are special tools for small screws and can be handled with just two fingers (and maybe the palm of your hand) as they have a swiveling end. the hex keys and nut drivers have a hole to be driven by the included crossbar if needed - do not insert another screwdriver there! This page was last edited on 4 November 2018, at 18:44.